Queen’s Park is proclaiming its first Equal Pay Day today to raise awareness of the earnings gap between men and women in Ontario. Equal Pay Day represents how far into the next year a woman, on average, must work to earn the same amount a man made in the previous year. Last year, Equal Pay Day was April 9 – this year April 16. The gap is widening! At the Workers’ Action Centre’s we are confronted daily with the many inequities faced by workers in the labour market. The fight for equal pay and decent wages is one of critical importance. The earning ability of women – as well as new immigrants, youth and workers of colour – is greatly affected by precarious work and low wages. Jobs across many industries where women make up a large percentage, have wages near the bottom-end of the pay scale; jobs such as bank tellers, childcare workers, personal home support workers, teaching assistants and flight attendants. We need to to change this unfairness! Since August 2013, we have been mobilizing workers in Toronto and around the province on the 14th of each month as part of the “Raise the Minimum Wage” campaign – demanding a $14/hr minimum wage, to bring workers’ wages 10% above the poverty line. 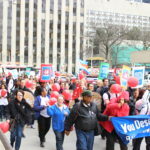 Our April 14th rally in Toronto was in front of one of the largest temp agencies in Canada to draw attention to the 40% difference in wages that temp agency workers earn compared to permanent employees. 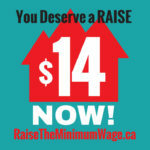 To find out more about the “Raise the Minimum Wage” campaign and actions across the province, check out their website at www.raisetheminimumwage.ca . To learn more about Equal Pay Day and the growing wage gap, check out: “A Growing Concern – Ontario’s Gender Pay Gap”, a report by Mary Cornish (Canadian Centre for Policy Alternatives) for visit the website for The Equal Pay Coalition.